The Rangers announced Tuesday that they’ve released right-hander Tyson Ross in order to clear a spot on the roster for Willie Calhoun, whose previously reported promotion to the Majors has now been formally announced. The Rangers also activated Adrian Beltre from the 10-day DL, though Evan Grant of the Dallas Morning News tweets that he’s not yet ready to play. Calhoun is in the Rangers lineup tonight, playing left field and batting seventh in his MLB debut. Ross, 30, was non-tendered by the Padres last offseason after shoulder troubles limited him to just one appearance in 2016. The right-hander spent much of the season attempting to rehab but was unable to get back to a big league mound after experiencing multiple setbacks. Ultimately, Ross was found to have the difficult-to-diagnosis thoracic outlet syndrome; he ultimately underwent surgery to alleviate the issue in October. Texas signed both Ross and Andrew Cashner to one-year deals this past offseason, hoping that the pair of former Padres teammates could eventually solidify the final two spots in a contending rotation behind the likes of Yu Darvish, Cole Hamels and Martin Perez. Ross made his way back to the Majors early in the summer, right around the team’s projected timeline, but he’s looked like a shell of his former self through 49 innings in a Rangers uniform. In that time, Ross has more walks (37) than strikeouts (36), which has been the primary reason for his unsightly 7.71 earned run average. The struggles of Ross and injuries elsewhere on the roster led the Texas front office to make the difficult decision to trade Darvish with just seconds to go as the non-waiver trade deadline loomed on July 31. That trade netted the Rangers Calhoun (in addition to minor leaguers A.J. Alexy and Brendon Davis), and Calhoun will now join a team that has somewhat improbably hung around the Wild Card race after trading away its ace back on July 31. He has been horrible all year. I wonder if someone will give him another shot next year? He never showed any signs of life. I’m guessing his next contract will be a minor league one. He can help the White Sox lose as their 5th starter on a minor league deal. As long as he’s not a bonehead like Tim Lincecum, who still demanded a Major League contract after he imploded in Anaheim. If Ross is humble and accepts a minor league contract to Single-A or Double-A and proves he can pitch, move him up a level at a time. No surprise. Ross has been so bad this season that I almost want to ask if he was trying to be bad. Sounds ridiculous but if you’re losing your rotation spot to guys like AJ Griffin and Nick Martinez, you’re doing something very wrong. Come back to SD. We have the room for you, TR. Remember how pissed most Padres fans were when they released him in the offseason? It always seemed like a good move to me, even though I do feel for him. 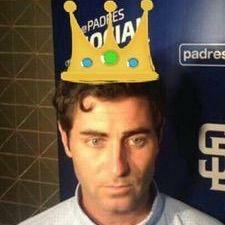 Most Padres fans were glad to see him go. Everyone knew he had huge medical issues. The O’s kept Ubaldo, im surprised the Rangers cut Ross loose. Both stunk up their rotations worse than dog logs in a bog. Come on back to SD. Let Balsley resurrect your career a second time..
Ross will probably receive minor league offers with invitations to spring training next year, and that’s about it. He’s gotta work his way back to a major league rotation, and that may take a while. Thoracic outlet surgery seems to be the new career-ender for pitchers. Can’t think of one yet who has come back successfully from it. Clayton Richard had it a few years back. He is basically the same inning eating 5th starter he was before the injury. True, however he appears to have changed his release point after the injury. I’d love to see what Dave Eiland could do with him over the off-season for the Royals. Tyson Ross always teetered on the edge of viability as a starter – while effective, he couldn’t allow his “stuff” to get any worse as he’s a two-pitch guy with marginal control. If either his slider or fastball was off, he had no other pitch to lean on. One could easily expect that his control wouldn’t be what it was before – it sure as hell wasn’t going to be better..but even then, he’s fallen off a cliff. His days as a starter might be done for – could make for an interesting bullpen arm though. Might be able to hide his shortcomings. Always develop a third pitch, kids. With his mechanics and high slider usage, he always had red flags. It was only a matter of time before injuries like this caught up to him and threw his career off the rails. It’s too bad, because he was great when he was in his prime. He posted a 3.08 ERA from 2013-2015 over 513.2 IP. I’m not sure how that is “teetering on the edge of viability as a starter”. You’re looking at the results, His results are good. But that’s not what is mean by ‘teetering on the edge of viability as a starter’. Ross throws his FB & SL 94% of the time. That makes him a 2-pitch starter. All it takes is for you to lose command of one pitch, and you become ineffective. Over 6+ years in the bigs, he never developed an effective 3rd pitch. For that matter, I can’t think of many 2-pitch starters that’s been able to survive for 6 years. That’s already really impressive. Theo’s carried a torch for him for quite some time. I’d be ok with it on a no-risk. Man, it’s crazy how this guy was an all star for the Padres just a few years ago. It just goes to show you how much of an impact these types of injuries can have on pitchers. Yessir – that TJ is no joke! I remember how Ross used to be a lock for the Padres. There are quite a few of them nowadays. Nate Eovaldi will be another.